What kind of saws do I need? What comprises a 'Nest of Saws?' These are questions newcomers to the craft ask most often, and so in that regard I invite the visitor to this web site to download and read Chris Schwarz's excellent article in the Spring 2008 issue of WoodWorking magazine, 'Understanding Western Backsaws.' Other great articles describing use, technique and care for the kinds of hand and back saws I offer may be reviewed at WoodWorking Magazines' saw blog. I can also freely dispense advise upon your initiating email contact here. My Restoration Philosophy: With a few exceptions, the tools I sell are not collector's saws. If the original lacquer is too far gone, I'll remove what's left and re-finish the handle (or simply clean it up if it's salvageable), and I certainly remove all rust. I polish the sawnuts, straighten the sawplate if necessary, retooth and sharpen the saw right—that's to say I do my dead-level best to remove all remaining flats after jointing, that the teeth are uniform and level, and that it's appropriately set (not underset and not overset, but set to ensure a thin kerf without degrading the action). This level of detail in the sharpening process is mainly what you're buying, on top of a good-looking saw that's been nicely rehabilitated. My saws are meant to be used and facilitate your woodworking satisfaction. How to Date your Saw: I encourage all visitors to this site to review Erik von Sneidern's excellent web site covering the manufacturing history of all Disston saws, located at www.disstonianinstitute.com. Erik presents a comprehensive history of the Disston line, and how to date your saw by examining the wording of the medallion. 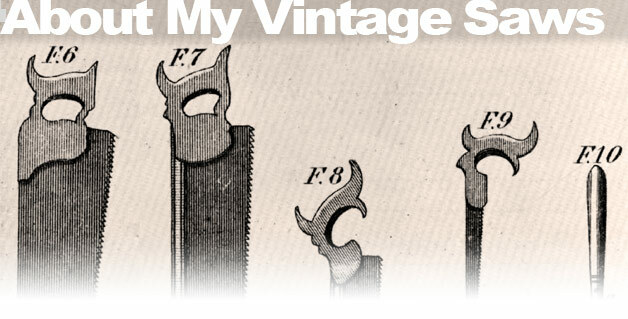 Current Stock: I update my list of restored vintage saws about once quarter, and you may view them here.